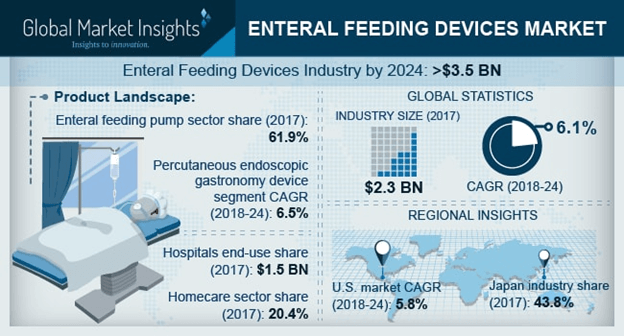 Enteral Feeding Devices Market size is set to exceed USD 3.5 billion by 2024; according to a new research report by Global Market Insights. Enteral feeding devices market growth should be further driven by technological advancements incorporated within enteral feeding devices. Improvised quality of enteral devices and innovations will increase its adoption rate among the developed countries such as UK and Germany having high per capita income thereby augmenting business growth. However, difficulties related to enteral feeding devices may restrain the market growth in future.